Amongst a squad rife with strange origins and unusual life stories, Betsy Braddock – the X-Men's Psylocke – may own the weirdest. Already a purple haired mutant with world-class psychic abilities, Betsy's consciousness was unwillingly transferred into the body of a supermodel ninja with no understanding of the difference between a ribbon and a full-on wardrobe. But that was a long time ago, the wounds have scabbed over and Betsy's ready to move on with her life, to put the whole thing to rest. Too bad fate and a number of forces beyond her control have other ideas. 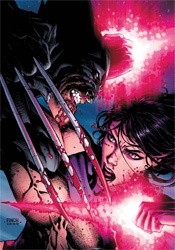 One of those forces, as I'm sure you might suspect from the cover, is Wolverine. Strangely, this issue is more concerned about Logan's well-publicized history and personal demons than it is about Psylocke's. A weird choice, considering Braddock barely gets more than a nod in the regular X-Men series, while doctor adamantium-claws seems to have his fingers in no less than twenty ongoing titles. It seems tacked on and cheap, like the bigwigs felt the story wouldn't sell on its own and the solution was to throw in a long fight scene with their most marketable character. It's more than that, though. Logan's tied into the single driving purpose behind this mini-series, but despite the constant flashbacks to memorable scenes in his past, it doesn't seem like everything fits together. I realize that impossible coincidence and dumb luck are the cornerstones of modern superheroics, but I think this issue stands as proof that there is such a thing as too much of both. I'm willing to suspend my disbelief a lot longer than most, but this was enough for even me to step back and think "ok, enough." Plot issues aside, Chris Yost's writing isn't particularly good. The aforementioned fight scene doesn't even serve its purpose as a visceral escape, constantly interrupted by jerky internal monologues and inconsequential high spots that don't seem to affect the combatants a few panels later. Perhaps the best thing I can say about the story is that its conclusion is framed nicely and works. But what's the point in a good finale without a relevant lead-in? It's like Yost figured out what he wanted the issue's waning pages to look like, tried writing backwards to get us there, and lost patience somewhere along the way. Yost's teammate on this adventure, artist Harvey Tolibao, is like a poor man's Joe Quesada… which isn't intended as a slight, really. Tolibao does decent enough work, but the natural comparisons to Marvel's current EIC and fleeting similarities to Bart Sears don't do him many favors. Under Harvey's watch, the occupants of this story pop off the page. Heaping bags of muscle, their tendons pulse and squirm under a paper-thin layer of skin. They circle and stalk one another like tense, furious anatomical models. He doesn't bring anything new to Psylocke, though, and many of the characters look like they were separated at birth, differentiated only by the color of their jackets and the stylistic decisions of their hairdressers. Tolibao has some work to do; although he's far from the worst Marvel has to offer. If it looks and reads like filler material it probably is filler material, and Psylocke looks and reads like filler material. It's a tale that was probably supposed to expand Betsy's personality, but in the end only reinforces the idea that there isn't all that much to her. Despite the wild origin story, she's always been treated as eye candy without much to add to the team in terms of personality. That hasn't changed with this mini. It doesn't stink, but it doesn't sing either. If you aren't an X-Men completist, you'll be safe skipping it.